The Master level architecture studio project that 2hD's Tom and Alina ran at Nottingham Trent University this year has concluded with an exhibition in the University's Arkwright building. The exibition was designed by Alina and featured a dress by fashion designer Kula Tsurdiu (the project client) alongside selected work from the architecture students. Alina and I are leading the Vertical Studio module this year at Nottingham Trent University, as part of the MArch (Masters in Architecture) course. It's a 10 week design studio delivered to both cohorts of the MArch course, aimed at bringing in practitioners with a particular set of approaches, whilst introducing new students to NTU and preparing final year students for their major dissertation projects. We've decided to build the studio around the notion of weaving — both as an approach to understanding one way of making structure and space and as an analogy for the multi-stranded assemblage of information, knowledge and ideas that go into an architectural design project. The site we've chosen is what we've termed an 'urban appendix' — a former thoroughfare truncated by the building of Victoria Station in Nottingham, and then overshadowed by its replacement, the Victoria Centre. This unloved backwater will be stiched back into the urban fabric by housing a dressmaker's shop, design studio and workshop. 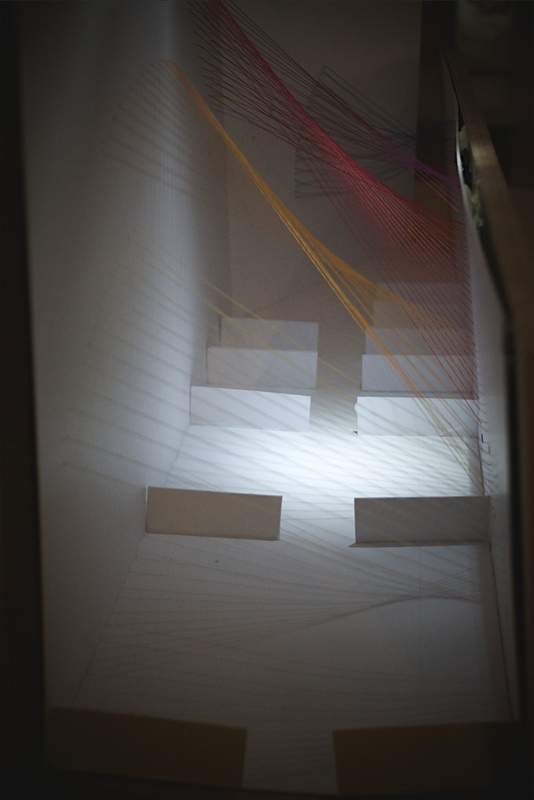 During the first week the students were set the ambitious target of putting on an exhibition of exploratory models. Following visits to Kula Tsurdiu (acting as client) and the NTU textiles exhibition and weaving workshops, the students investigated techniques of stitching, pleating, weaving and fusing to create their models. It was great to see a lot of careful investigation and reckless experimentation coming together in a short space of time — the students really responded to the challenge and we look forward to seeing their designs develop over the coming weeks. We have collaborated with Various Architects on an entry for the international architectural design competition for Otaniemi central campus of Aalto University, Finland. The competition was for design of the new School of Art, Architecture, Design and Media (50,000 sqm), together with the masterplanning of the central square for the largest university campus of Finland, close to Helsinki. The site is surrounded by iconic modernist buidings designed by Alvar Aalto, who originally also masterplanned the campus. We submitted the entry last week and it was great fun collaborating on this project with the team at Various Architects — with whom we are now sharing an office space in Oslo. The competition is anonymous, so it is not possible to show images of our entry yet, but the shortlisting for phase two of the project should be announced in November 2012. Furthering our exploration and experiments using the cardboard module developed for the Lost Cuckoo project, Marcus Rowlands and 2hD Architects ran two "lectures" at Nottingham Trent University. With the participation of staff and students from the School of Architecture, Design and the Built Environment, and in a lecture hall setting. This was, however, not your standard lecture format: the starting point was for each person to build a module, then to team up and build an assembly, and finally to bring everything together to create a space-within-a-space... in which the 'lecture' would happen. We have put together this short video about our Lost Cuckoo project with artist Marcus Rowlands from the DVD produced by the Lakeside Art Centre, who hosted the event last year. The project was great fun and we are looking forward to developing this concept in other art festivals this year! A public art and participation project by Marcus Rowlands artist and 2hD architects, involving pupils, parents and staff from Brocklewood, Melbury and Portland schools in Nottingham. Funded by The Arts Council, Lakeside Arts Centre and Nottingham Education Improvement Partnership, with support from Faspak and Staples. Original footage and sound by Vent Media. 2011. The Lost Cuckoo project was commissioned and supported by the Arts Council England and Nottingham Lakeside Arts. The proof of the pudding, as they say, is in the making. I spent Sunday volunteering at the site of our Childrens' Home project, helping them to get the building phase of their Living Room project underway. It's been a fascinating project to be involved in. We were approached by The Mighty Creatives who were looking for someone who could work with the staff and residents at the Home to redesign their living room, making use of IT to communicate and visualise the process. In the end, we used StickyWorld and SketchUp with the LightUp plug-in… and if we could have found another software with a JoinedUp name, we'd have considered that too. It's a tiny but intense project, and I found the design process really challenging. Working on occupied houses is always pretty involved, as being invited into the home requires a great deal of sensitivity to residents' preferences and relationships. At the same time, your own knowledge and experience as 'the professional' needs to be given a voice. As you'd imagine this particular living space is charged with a lot of meaning for many different people... But, by working together, we gradually achieved a design that everyone could take pride in. The idea is that as much of the making work as possible is done by the staff and residents of the home, but I invited myself along on Sunday to lend a hand as they got underway. The electrian had already been in to do the first fix, so the next stage was setting out the studwork for the 'portal' feature, the lighting raft and the storage/entertainment wall. We made pretty good progress- a bit slowed by the effort of breaking up the world's densest fireplace hearth, but by the end of the day the design was beginning to pop off the page and in to the space. I loved being there to see this happen and hope to be back again as the project progresses. Living Room Project from 2hD Architecture Workshop on Vimeo. The Lost Cuckoo project culminated last weekend with an event at the Wheee! International Childrens' Theatre and Dance Festival at Nottingham's Lakeside Arts Centre. Nearly 1000 visitors participated in this live public art project, building imaginative and gravity-defying structures. In the weeks leading up to the festival, we designed with artist Marcus Rowlands and families from three schools in Bilborough, a cardboard building “module”. In essence, a box with a “secret corner” that could be popped in to join boxes together at interesting and unpredictable angles. We've blogged about the project before: You can read more about the process, the event, and catch up on our live blog from the event itself. We really enjoyed working on this project and are very proud of the results. This is largely down to our brilliant collaborators: Marcus Rowlands, Ruth Lewis-Jones from the Lakeside and — most importantly of all — the children, parents and staff from Portland, Melbury and Brocklewood schools. Thanks also must go out for the generous support given by the Lakeside Arts Centre, the Arts Council England, Faspak, Staples and Nottingham Education Improvement Partnership. A great article on East Midlands regional architecture practice has appeared in the Journal of the Royal Institute of British Architects. It features 2hD's Alina Hughes talking about her dual roles in practice and education, and the importance for the region of retaining talented graduates. See the online version of the RIBA Journal. We have started work with artist Marcus Rowlands on the Lost Cuckoo project. Working with families from 3 schools in the Bilborough area of Nottingham, we will collaborate on the design of a bespoke cardboard module or system. This will be used by the families and visitors at the International Children’s Theatre and Dance Festival in the live creation of an interactive community sculpture. In our first set of workshops we asked families to build with standard cardboard boxes and colourful tapes. They produced an amazing array of sculptures and spaces, pushing the boxes to do the unexpected and giving us plenty of inspiration to start the design of our special module. Further workshops will run over the months until the Festival, on June 4th and 5th at the Lakeside Arts Centre. This project is being supported by the Lakeside Arts Centre, the Arts Council England, Faspak and Nottingham Education Improvement Partnership. The Lincoln Architecture Society invited 2hD along to give a talk as part of their evening lecture series. I was genuinely impressed by the professionalism of the students who run the society — an excellent welcome pack in my email a few days before the event giving all the info I needed to get to there and a warm welcome and introduction. Here are a few of the slides from my talk, which covered the Sky Vault project, the barn conversion in the Dordogne, our work on the NTU architecture course, Mission Control (our hairy micro-office), our Structures on the Edge shortlisted competition entry and the inflatable event space. Their lecture series looks great — it brings kudos the the Lincoln School of Architecture and is definitely worth checking out if you are in the East Midlands. Take a look at their website.